Vitamix and Cuisinart – Big Love! So, you know how much we love the Vitamix Blender and Cuisinart Ice Cream Maker in each of our studios. But did you know how much they love EACH OTHER? In summertime we love to eat light. Start each day with a breakfast smoothie. 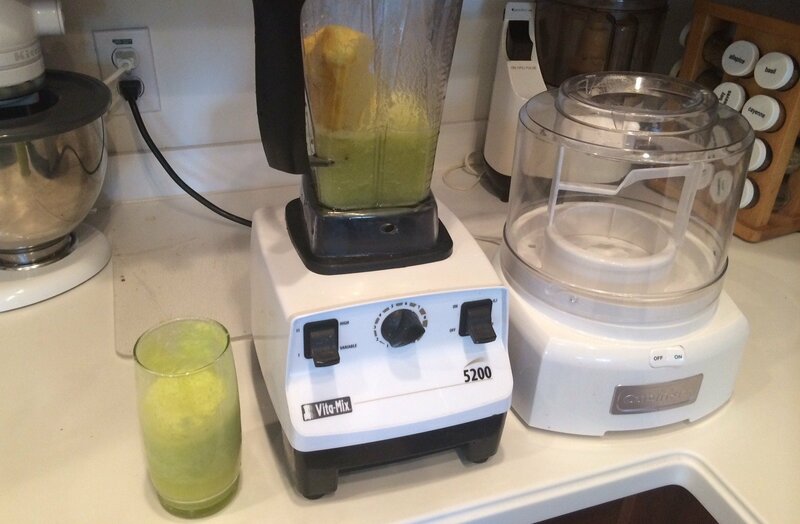 Straight into the Vitamix go: Strawberries & Spinach, or Pineapple, Lemon & Ginger, or Carrots, Coconut Water & Lime. No chopping required – the Vitamix blends it all to a super-smooth smoothie! Want to see more? We’re thinking of watermelon with mint, sprinkled with black Hawaiian sea salt, or cucumber basil with a cheeky hint of cayenne, or coconut mango with lemongrass, or orange and apple with rosemary, or, or or! Comment with combinations you’d like to make and let’s play with some recipes!